This post took me longer than usual to compile because there really is so much to do in Melbourne that's awesome for the whole family! We love Melbourne so much that we'll probably keep going again and again! The Penguin Parade is one of the key attractions at Philip Island. You'll get to see the Little Penguins coming home from their dinner and burrowing into their homes. The kids loved watching the penguins up close! The Koala Conservation Centre is part of the 3 park pass that we bought, which includes Penguin Parade and Churchill Island Heritage Farm. Depending on your luck, you may not be able to see koalas up close. You might want to visit Healesville Sanctuary (details later) for a better view of the koalas. The Churchill Island Heritage Farm lets you observe sheep shearing as well as try your hand at milking a cow. Very hands on, educational and fun for kids! Beautiful town made entirely of chocolate! If you're a chocolate lover like me then you MUST visit Pannys Amazing World of Chocolate! Everything is chocolate in there and you'll even get to make your own chocolate and eat it! Yummy! The Puffing Billy Railway is a must especially if your kids love trains! We got to hang our legs out of the carriage, watch the lovely countryside go by and thoroughly enjoyed the ride! The Yarra Valley Gateway Estate is great for picking strawberries at the end of autumn/start of winter where most farms would have been out of strawberries. You can visit wineries and other attractions at Yarra Valley at the same time. For apple-picking, Paynes Orchards is the orchard to go. There are rows and rows of apple trees with plenty of space for the kids to run and pick apples! If you've got limited time and want to do it all in just one place, then you can consider Naturipe Fruits. They sell everything from strawberries to apples, depending on the season. There's even a bouncy castle and live singing to entertain visitors! You can't go to Australia without visiting the Great Ocean Road, which goes from Melbourne all the way to Adelaide. It's a really long road with lots to see so do be realistic and take into consideration your return journey when planning how far to go on the Great Ocean Road. If you are the outdoorsy type, you can consider fishing for your own trout and salmon at the Buxton Trout & Salmon Farm. You only pay to rent their rods and for whatever you managed to catch (if you catch more, you pay more). It was a really fun experience for the hubby! 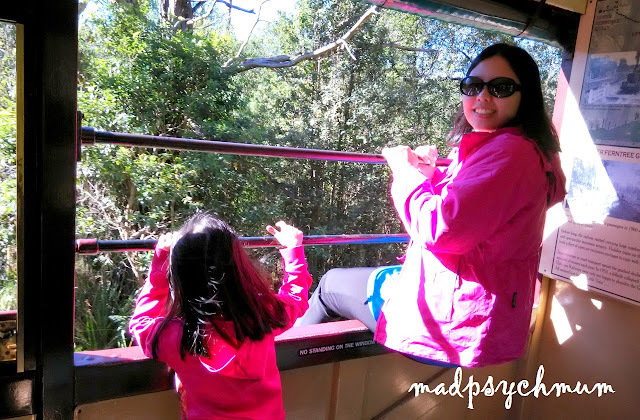 In my opinion, Healesville Sanctuary is the best place in Melbourne to see Koalas up close. If you pay a fee, you'd even get to enter the enclosure and come within an arm's length of the koalas. It was quite an experience for the kids! There are also other animals to see and even an animal hospital where you can see live surgeries if you're lucky! Although there are no performances at Myuna Farm as compared to Churchill Island Heritage Farm, there were more animals to see. We got really close to a donkey, camels, pigs and even minature horses. The kids had a great time! [Admission Rate] Singles AUD 8, Family of four AUD 28. Children under 1 are FREE. The Manuka honey we got from Pure Peninsula Honey was seriously the best honey ever! We totally regreted not getting more and definitely will return again if we had a chance. They also have a bee observation room for the kids to watch the bees at work, which was really fun and educational for the kids. We loved Melbourne Museum! It was one of the best museums we have visited! There were cool exhibits of dinosaur bones, various animals and even the human body. They also had the best Children's Gallery! Our best kid-friendly museum, i.e. National Gallery Singapore (read about our experience here), pales in comparison (sorry guys, it's a tough act to follow)! 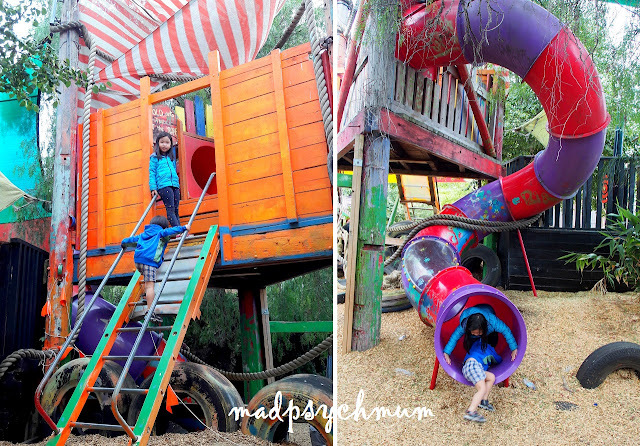 I insisted on bringing the kids to St Kilda Adventure Playground even though the hubby wasn't keen because it was highly raved about by other visitors. It was also not your typical playground that we can find anywhere in Singapore or even Australia. The kids really enjoyed themselves running, jumping, swinging and flying! Just a short 15 minute drive from Melbourne city is Brighton Beach, home to the very famous and iconic Brighton Bathing Boxes. The super colourful little houses, the rolling waves and the clear blue sky make it a great place to take lots of Instagram worthy photos with your kids. The one I took with mine became my Facebook profile picture for months (#truestory). We decided to visit Half Moon Bay last minute and did not regret our decision. Although it's not as colourful as Brighton Beach, it's still really beautiful and calm. It's a must visit if you're a beach person. And finally, if you don't want to pay to see the Little Penguins at Philip Island, guess what? You can see the St Kilda Little Penguins for FREE at St Kilda Breakwater, which is located at the end of the boardwalk at St Kilda Pier. 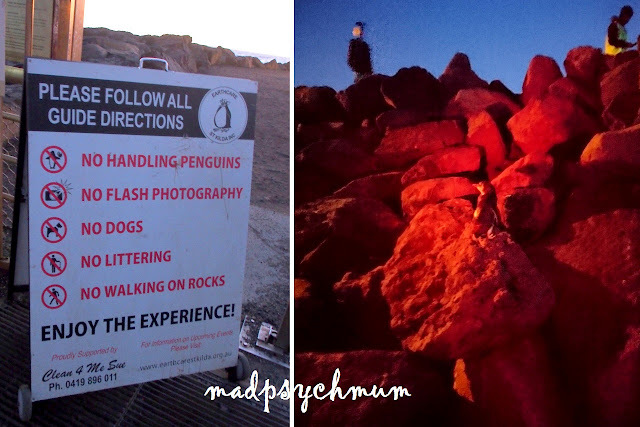 There were a few times where the penguins actually walk out right in front of us. So cool! This post is part of my series on Kid-Friendly Attractions Around the World and my travel page, MADPSYCHMUM TRAVELS, where you can find other family-friendly itineraries!